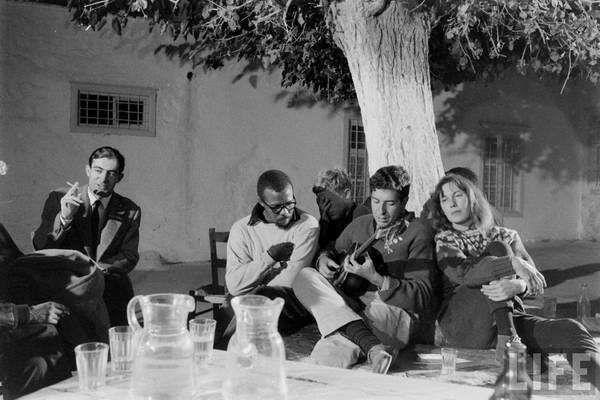 In the '50s and '60s, the Greek island of Hydra was a magnet for artists. The emerging Canadian poet, Leonard Cohen, arrived in 1960 and stumbled upon an ex-pat community headed by two Australian writers: George Johnston and Charmian Clift. George and Charmian offered the young Leonard a room and arranged for him to perform his poems and songs for their assortment of friends: Sydney Nolan, Brett Whiteley, Beat Generation poet Allen Ginsberg and others. In September of 1960, just 7 months after arriving on Hydra, Leonard bought a house on the hill above Hydra town. This became his home for the next 20 years. It was on Hydra during the late 1960s that Leonard gave up the idea of being a poet/novelist and emerged as a singer/songwriter. It was on Hydra that Leonard gave his first concert. A concert organised by George Johnston the writer of the iconic Australian novel My Brother Jack. And so began Leonard Cohen's career as a singer/songwriter.